Some of the listed ISPs might be actually dysfunctional or servicing only specific markets (for example: mobile phone companies, hosting companies or internet exchange points). The historical data in this report does not include companies which do not exist any longer at the time of writing this report. All statistics are based on data which was published by APNIC on 2009-11-11. The following table lists all the ISPs included in this report, including all known variations of their current or recent business names. For some reason many operators are using a brand which is different from their registered company name. For the sake of clarity, I have used shorter names in the latter parts of this report. The chosen short names are listed in the table. I have also included a link to the ISPs web site. AngkorNet AngkorNet / Cambodia Data Communication Co. Ltd.
Beeline Beeline / Sotelco Co. Ltd.
BeyondTel BeyondTel / (Cambodia) Media Data Communication Networks Co. Ltd.
CB Cambodian Broadband Technologies Co. Ltd.
CIDC IT CIDC Information Technology Co. Ltd.
Cambo Technology Cambo Technology (ISP) Co. Ltd.
Chuan Wei Chuan Wei (Cambodia) Co. Ltd.
City Link City Link Co. Ltd.
DTV Star DTV STAR Co. Ltd. Finder IXP Finder IXP / Interquess Enterprises Co. Ltd. Flash Tech Flash Tech Co. Ltd.
Hello Hello / TMIC / Telecom Malaysia International (Cambodia) Co. Ltd.
MekongNet MekongNet / Angkor Data Communication Group Co. Ltd.
MekongNetIXP MekongnetIXP / Angkor Data Communication Group Co. Ltd.
MetFone MetFone / Viettel (Cambodia) PTE. Ltd.
Online Online / Cogetel / AZ Communications Co. Ltd.
Smart Mobile Smart Mobile / Latelz Co. Ltd.
Star-Cell Star-Cell / Applifone Co. Ltd.
TeleSURF/Mobitel TeleSURF / Cellcard / Mobitel / CamGSM Co. Ltd.
WiCam WiCam Corp Co. Ltd.
WirelessIP WirelessIP / Wireless Internet Provider Co. Ltd. Note that MekongNet / Angkor Data Communication Group Co. Ltd. is listed twice; as MekongNet and MekongNetIXP. This is because they are appearing with these two distinct identities in the APNIC database. Presumably the other allocation is for normal ISP functions and the IXP allocation is for an internet exchange point. The following table lists the age of all ISPs from the oldest to the newest. The age is based on the time the ISP received their first resource allocation (IP address block or autonomous system (AS) number) from APNIC. 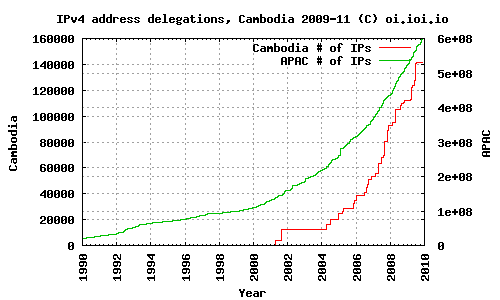 The following two graphs display the amount of IP addresses delegated to Cambodia compared to the amount of IP addresses delegated in APAC/APNIC region. The first graph starts from the year 1990 and the second one from the year 2000, otherwise there is no difference. The graphs give some sort of indication of the internet development speed in Cambodia. 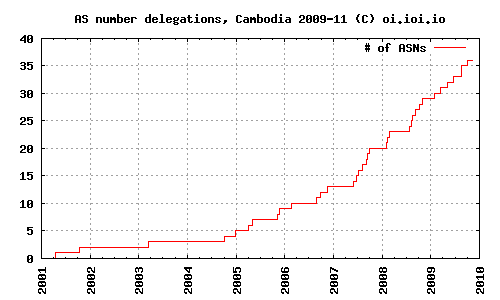 The following graph displays the number of autonomous system numbers (ASNs) delegated to Cambodia. Typically one ISP uses one ASN, but in some cases they may use several. 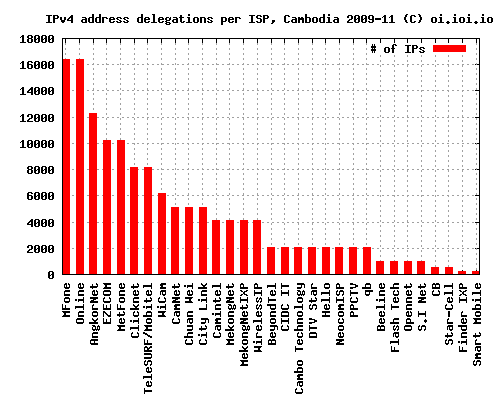 The following graph displays the amount of IP addresses delegated to each Cambodian ISP at the time of this writing. The amount of addresses may give some sort of indication of the ISP’s size, but it is also heavily dependent on ISP’s architectural decisions (for example a mobile phone operator may use a single IP address to provide service to thousands of customers by using network address translation (NAT)). The following table lists all delegated IP address ranges and ASNs per ISP in Cambodia. The table is sorted by the amount of IP addresses per ISP. The Cambodian internet market has clearly gone through a period of rapid growth recently. Companies are now investing in modern infrastructure, such as fiber-optic lines. In the recent past, most operators were selling satellite-based capacity which has a very high latency. Lack of uplink capacity, no marine cable landing. Lack of carrier neutral internet exchange points and co-operation to connect to existing ones. Some ISPs are over-subscribing capacity (they have too many subscribers compared to their available up-link capacity). Lack of modern, market-driven coordinating entity. Lack of willingnes for co-operation in competing market. Lack of IPv6 deployments (IPv4 addresses are runnning out soon).